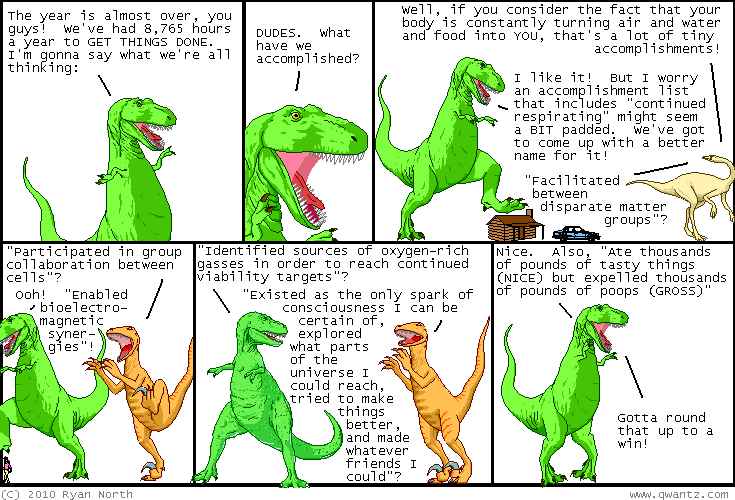 Dinosaur Comics - December 24th, 2010 - awesome fun times! December 24th, 2010: You guys, here's the thing: you are awesome. Thank you for reading my comic this year, thank you for telling your friends about it, thank you for giving me the privilege of working as a cartoonist. It's been awesome, and I'm super grateful for it. I owe each of you a high five, collectable on demand! Next week, I'll be taking my Year-End Holiday and running comics I've chosen from the past SEVEN YEARS that I think you'll enjoy. If you haven't been a reader since day one, they'll still be "new to you", which is what I'm telling myself whenever I feel bad about recycling non-character-images-and-layout content!